When the Phillies score four or more runs, they are 51-29. Less than four, 8-68. That pretty well defines their season. Phinally a Philly win over the Mets, 4-3, last night, a defeat that snapped New York’s 11-game winning streak on the road. It was only third Phillies win in 17 games between the two clubs. While the Mets have clinched the division title, they are battling for the home field advantage in the playoffs which is huge. By clinching the NL west last night, the Dodgers now trail the Mets by one game. Ruf hit a three-run homer in the first and Altherr drove in the fourth run in the eighth inning. Duda went deep twice, including a two-run homer off Giles in the ninth. It was only the third homer Giles has yielded in his big league career. But, Giles struck out Travis d’Arnaud for his 14th save. Earlier, Travis’ older brother, Chase, struck out as a Phillies pinch hitter. It was the first time they had been on a baseball field together since an all-star game in the minor leagues in 2009. Loewen, one of six Phillies pitchers, picked his first win since 2007 and first hit since 2011 . . . Blanco was not at the game, instead he became a daddy, Adrian, his second son . . . Herrera returned from three days off and collected four hits . . . Franco could be back for the last three games this weekend. Phillies first game was Monday in Dunedin against the Blue Jays. CF Ramon Quinn was back on the field for the first time since he sustained a tear in his left hip flexor on June 13. 3B Maikel Franco had five at-bats. Six pitchers worked for the Phillies. The FIL is all about instruction. Base-runners will work on stealing bases without the concern of being caught. One reliever who was drafted in June threw a slider for the first time. Another worked from a different side of the rubber and a third focused on being quicker to the plate with runners on base. Check out http://www.phillies.com/alumni for excerpts from the September 30, 1915, Philadelphia Inquirer story about the Phillies pennant-clinching game from the day before. The headline: PHILLIES, BEATING BRAVES, CAPTURE NATIONAL’S FLAG. with Phillies for first place lost to Florida, 8-1. Eastern Division title with four games left for third straight year and eighth overall. Phillies have used a club-record 30 pitchers this season, breaking the old mark (28) set in 2007. Overall, they are tied for fourth behind Atlanta (37), Yankees (33) and Rangers (31). Astros fell to third place in the AL west for the first time since April 18. Cole Hamels, Jimmy Rollins and Chase Utley are headed for the playoffs. is the title of my new book which will be available starting next May in book stores and on-line. Larry Andersen penned the foreword. Publisher again is Triumph Books (triumphbooks.com). For the first time since 2006, the Mets are in the postseason. Their road was paved by their dominance of the Phillies, 14-2. Last three games between the Phillies and Mets starts Tuesday night at Citizens Bank Park. Phillies are playing to avoid 100 losses, sitting on 97 as Tuesday night comes around. Three with the visiting Marlins this weekend ends the Phillies season. From Elias Sports Bureau: The Mets completed a four-game series sweep in Cincinnati on Sunday by defeating the Reds, 8-1. It was the Mets’ 31st consecutive road game in which they scored three or more runs, matching the longest streak of its kind in National League history! 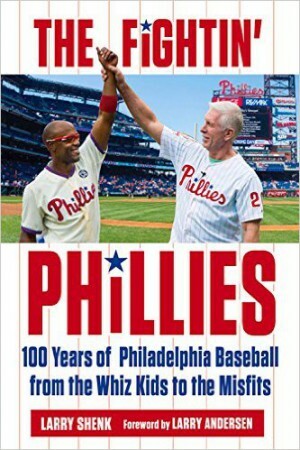 New York now shares that mark with the 1891 Phillies, Chicago from 1894 to 1895, and the 1897 New York Giants. Several AL teams have had longer such streaks, including the 1937 Yankees, who scored at least three runs in a major-league record 45 consecutive road games. First Florida Instructional League game for the Phillies took place Monday against the Blue Jays in nearby Dunedin. October 16 is the last day for the 17-game schedule that also includes the Yankees and Orioles. Wins and losses aren’t the focus but instruction is. No records or stats are kept. A total of 58 players dress and work out at Carpenter Field but their home games are at Bright House Field. No games are scheduled for Sundays. Not all 58 will be there the entire time. RHP Jake Thompson, acquired in the Cole Hamels trade, will be there for a short time. OF Nick Williams and C Jorge Alfaro, also part of that deal, are also in camp. Refining base-stealing is on the agenda for Williams. Alfaro, who injured an ankle in June and was out of action until this month, needs playing time. Three 16-year-olds, OF Jhailyn Ortiz, C Rafael Marchan and LHP Manual Silva and 22-year-old OF Reggie Wilson are making their debuts in pro ball. Coordinators: Doug Mansolino (field coordinator), Andy Tracy (hitting), Rafael Chaves (pitching), Chris Truby (infield), Ernie Whitt (catching), Andy Abad (outfield/base running) and Brett Gross (video coaching). Staff: Pat Borders (manager), Rob Ducey, Rafael DeLima, Waner Santana (hitting), Roly deArmas, Shawn Williams (instructors), Carlos Arroyo, Brian Sweeney (pitching). Athletic Trainers: Joe Rauch, rehab coordinator, Troy Hoffert, Michael Hefta, Aaron Scott. Strength and conditioning: Jason Meredith, coordinator, Ken Matanane, Seth Gregorich. Two Phillies outfielders, Cord Sandberg and Aaron Altherr, have been selected to the Rawlings Gold Glove team in the minor leagues. To be eligible to receive the Award, players must have participated in one of the 10 domestic-based, full-season leagues, and shown outstanding defensive skills. The Rawlings Gold Glove Award® was re-introduced to Minor League Baseball in 2011 after an almost 50-year hiatus. Sandberg, Lakewood’s left fielder, recorded a .983 fielding percentage in 120 games. He had 232 chances and recorded 13 assists. Sandberg, 20, was a third round pick of the Phillies in the 2013 draft out of Manatee (FL) High School. Altherr, a right fielder who split the season between Double-A Reading and Triple-A Lehigh Valley, was perfect in 107 games in the field, recording 279 chances and eight assists without committing an error. Altherr, 24, was selected by the Phillies in the ninth round of the 2009 draft out of Agua Fria High School in Avondale, Arizona. The Phillies clinch first NL pennant with a 5-0 win at Boston, a 1-hitter for RHP Grover Cleveland Alexander, his 30th win. It is his fourth 1-hitter and 12th shutout of the season. 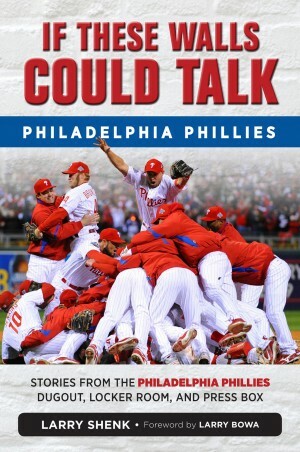 A story about this game will be posted at http://www.phillies.com/alumni later today. Overlooked yesterday (September 28) was a great moment in baseball history that took place at Shibe Park on the last day of the 1941 season against the Philadelphia Athletics. Boston’s left fielder, Ted Williams, entered the last day of the season with a .400 average. Rather than sit out the double-header, he went 4-5 in the first game and 2-3 in the second game to finished .406, the last .400 hitter in baseball history. is the title of my new book which will be available starting next May in book stores and on-line. Larry Andersen penned the foreword, very entertaining as one might expect. Publisher again is Triumph Books (triumphbooks.com). Nationals not only suspended Papelbon for the rest of the season but removed his jersey from the team store. Needless to say there haven’t been many fun moments this season for the Phillies. Winning the last road series this weekend in Nationals Park may rank as the most fun weekend. Not only did the Phillies help knock the Nationals out of the playoff race but they beat Papelbon with an eight-run ninth inning on Sunday. Before he took the mound in that inning, Pap and Harper got into a fight in the dugout. Yes, there’s still a Natitude in DC thanks to Pap. It was the first game in which the Phillies scored as many as eight runs in an inning in the ninth inning or later since September 17, 2005, when they scored ten runs in the ninth inning of a 10-2 come-from-behind victory in Miami. Source: Elias Sports Bureau. On the 3-6 trip, Phillies starters were awesome, posting a 1.74 ERA over the nine games. A little more offense could have turned the trip around as the Phillies lost four 2-1 games and a 1-0 decision. Yet, it’s hard to point the finger at the offense that is missing Franco, Hernandez, Howard and Brown. Phillies finished the season only 26-55 on the road, their worst record since the 1942 team went 19-58 during the era when they played 77 games on the road. Sunday morning, the Phillies announced that Nolan will not throw another pitch this season. After last year’s June draft, he worked 55.1 innings in 12 pro games. Nola was Reading’s starting pitcher in the season opener this year, April 11, in Portland. He lost, 4-2, allowing four runs in 4.2 innings. He ended the season with five scoreless innings on Saturday night, giving him 187 total innings. Guess you could say he came a long way this season. two home-run game on Friday night which included an inside-the-park grand slam became a very notable performance: first inside-the-park GS in the majors since 1999, Randy Winn, Tampa Bay Rays against the Yankees . . . first for a Phillies player since 1956, Ted Kazanski at the Polo Grounds against the New York Giants . . . became the third Phillies rookie with two homers, including a grand slam in a game, joining Mike Schmidt (1973) and Pat Burrell (twice in 2000). Sunday Aaron made the greatest catch of the season for the Phillies. Pope Francis’ visit to Philadelphia caused the Phillies to change their Amtrak travel plans following Sunday’s game. Because of street closings, potential traffic volume, tourist buses parking in the sports complex and uncertainty that buses could meet the traveling party of 60 at the 30th Street Station, the Phillies returned home from Washington, DC, today. The charter train took them to Wilmington from where buses took them to Citizens Bank Park. In the fastest game ever played in the major leagues, it takes the New York Giants 51 minutes to beat the Phillies, 6-1, at the Polo Grounds. Most batters swung at the first pitch and ran the bases at will in the final game of the season. Before a sellout crowd of 58,554, the final game in Vet history is won by the Atlanta Braves, 5-2. Following the last out, emotional and memorable closing ceremonies are held featuring the 2003 Phillies and nearly 100 alumni, including Steve Carlton, Mike Schmidt and Tug McGraw. To Bobby Shantz, the left-handed pitcher who won the 1952 American League MVP with the Philadelphia A’s, who turned 90 on Saturday. Bobby’s career ended in 1964 with the Phillies, who sent him a Phillies jersey with “Shantz 35” on the back, the number he wore with the Phils. Bobby, his wife, Shirley and daughter will celebrated with their weekly round of golf on Tuesday, weather-permitting. Pirates’ Gerrit Cole has 18 wins. Closer Mark Melancon saved 15 of them. Each of the Rockies outfielders, Charlie Blackman, Carlos Gonzalez and Corey Dickerson homered in the fourth inning vs. the Dodgers on Friday night in Denver. Only one other team in the last 12 years to match that, Blue Jays’ Alex Rios, Vernon Wells and Matt Stairs, May 20, 2007, at Citizens Bank Park off Geoff Geary. Phillies won, 5-3. Rollins and Utley played in that game as they did on Friday night. The Orioles reached a franchise first by being shut out three straight games by the same team. For Boston, three consecutive shutouts was the first for the Red Sox since 1958. Nothing would be more rewarding than winning some games in Washington, DC, this weekend and eliminating the Nationals. If that happens, the Mets couldn’t clinch at Citizens Bank Park next Tuesday, Wednesday or Thursday nights. Seeing the Mets celebrate in Philly is a stomach turner for Phillies fans. Ugh! To win in Nationals Park, the Phillies will need to score some runs, a revelation I realize. Zimmermann, Strasburg and Gonzalez will face the Phils, the same starters during Washington’s three-game sweep at Citizens Bank Park three series ago. In six games on this trip, the Phillies scored 12 total runs, six coming in one game, their lone win. Ugh! Asher turned in his most impressive outing last night, allowing one hit through six shutout innings. The streak ended with an infield hit and a triple. He left after seven innings with two of his team’s five hits, including the only extra base hit. For his efforts, his record fell to 0-5. 13th time the Phillies have been blanked, fourth by 1-0 score and second time the winning team used six pitchers. A walk and two singles in one inning but no runner reaches second base. Can that happen? Well, it did last night to the Phillies. Altherr walked to start the third inning and was caught stealing. Asher got his first big league hit. Galvis’ grounder hit Asher who was out. Freddy was credited with a single. 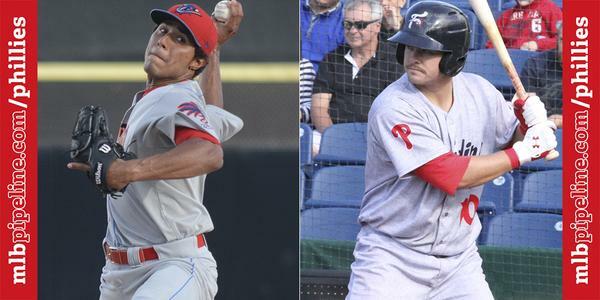 RHP Ricardo Pinto and C Andrew Knapp are the 2015 winners of the Paul Owens Award presented annually since 1986 to the best pitcher and player in the Phillies system. They’ll receive the awards pre-game Thursday, October 1. Pinto, 21, split his season between single-A Lakewood and Clearwater, combining to go 15-4 in 24 starts with a 2.97 ERA and 105 strikeouts in 145.1 innings pitched. He allowed two earned runs or fewer in 17 of those starts, including five scoreless outings of 6.0 innings or more. He was signed as an international free agent out of Venezuela in December 2011. Knapp, a 23-year-old switch-hitter, just completed his third minor league season: .308 with 35 doubles, 13 home runs, 84 RBI, 77 runs scored and 51 walks between single-A Clearwater and double-A Reading, setting professional highs in all of those categories. The Roseville, Calif., native was selected by the Phillies in the second round of the 2013 draft out of the University of California at Berkeley. International Scouting Director Sal Agostinelli has been selected as the 2015 recipient of the Dallas Green Award, given annually to an amateur or professional scout who best exemplifies the Phillies standard for scouting while demonstrating the same loyalty, work ethic, dedication and passion as the award’s namesake. It is also recognition of the scout’s ability to judge not only a player’s talent, but also his character and heart. Sal will receive the award pre-game next Wednesday. Agostinelli, who was named to his current position in 2012 after spending 15 years as the international scouting supervisor, has been a member of the Phillies scouting staff since 1993. Since joining the department, he has had a hand in signing several prominent international players, including Carlos Ruiz, Freddy Galvis, Cesar Hernandez and Maikel Franco. Hunter Pence’s season is over because of a concussion. Cole Hamels went six innings last night and got his fifth straight win; record now 5-1 with Texas. Royals clinch division for first time since 1985. The Mets’ Daniel Murphy has 69 RBI, 30 coming after the seventh inning, including the tie-breaking triple in a 3-run seventh inning. Win reduced Mets magic number to 3. A baby was born last night during Giants-Padres game at Petco Park. Text book baseball? Not exactly. The Marlins evened the series with a 4-3 win in 11 innings last night. Two of their runs were unearned. One of those came in the 10th, the first blown save for Giles or any Phillies closer for that matter this season. Of the three Phillies runs, the first came on a double play grounder with the bases loaded and no out, the second on a wild pitch which needed a review to overturn the call that the runner was out and the third on a two-out single by Galvis. That hit was the Phillies third in the last 37 at-bats with runners in scoring positions. Buchanan turned in the fourth straight strong outing by a Phillies starter but the offense was silent, six hits, including two doubles. So, the rubber game in the series is Thursday night. Thursdays haven’t been too kind to the Phillies, 3-11. Maybe it will rain. Oops, Marlins Park has a dome. RHP: Randy Alcantara, Gustavo Armas, Ismael Cabrera, Luis Carrasco, Jimmy Cordero, Seranthony Dominguez, Edgar Garcia, Luis Gonzalez, Skylar Hunter, Franklyn Kilome, Kenny Koplove, Luke Leftwich, Mauricio Llovera, Sam McWilliams, Adonis Medina, Jairo Munoz, Feliz Paulino, Alexis Rivero, Robert Tasisn, Jake Thompson, Albert Tirado, Shane Watson. LHP: Bailey Falter, Nick Fanti, Tyler Gilbert, Matt Imhoff, Manuel Silva, Will Stewart, Ranger Suarez. C: Jorge Alfaro, Edgar Cabral, Rodolfo Duran, Deivy Grullon, Rafael Marchan, Nerluis Martinez. Gamboa, Brendon Hayden, Jan Hernandez, Scott Kingery, Kyle Martin, Josh Tobias, Mitch Walding, Lucas Williams. OF: Zach Coppola, Mark Laird, Juan Luis, Bryan Martelo, Jhailyn Ortiz, Greg Pickett, Jose Pujols, Cornelius Randolph, Jiandido Tromp, Nick Williams, Reginald Wilson. St. Louis scores in the sixth inning to break rookie RHP Grover Cleveland Alexander’s 41 consecutive scoreless innings streak, a Phillies record that hasn’t been broken. The answer can be found at http://www.phillies.com/alumni where Paul Hagen’s written another “Where are they now? feature. R.I.P, Yogi Berra. Died Tuesday night, the 69th anniversary of his major league debut. A great catcher, great character, a national treasure. Kevin Fransden is back with the Giants. Chase Utley hit his first career lead-off home run last night. Jimmy Rollins started at shortstop for first time since September 6. The Dodgers had only four hits and struck out 13 times but won, 3-1. Since OF Eric Young joined the Mets, he’s hitless in five at-bats but has scored nine runs. In a season of change and with more changes coming, the Phillies have some stability in the dugout with Mackanin named manager. As the rebuilding continues, Mackanin is the perfect one to run the team. His 47th season in pro ball next spring will be different. Mackanin scheduled the daily spring training workouts this year but will really be in charge come February. He’s managed before in the minors and three times as an interim in the major leagues. His minor league managerial stints included rookie league, A, AA, AAA. Plus, he managed in Latin America in the offseason. 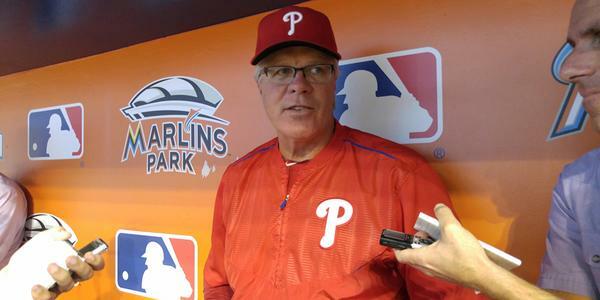 The Phillies will hold an organizational meeting in Clearwater on October 26-29. Andy MacPhail is expected to be the president by then and run the meetings. Whether a new GM will be hired by then is to be seen. But at least they have a manager as they begin making plans for next season. Reading manager Dusty Wathan has joined the Phillies for the rest of the season. Dave Brundage, the Lehigh Valley manager, was added following the end of the IronPigs season. Asche delivered his first two-home run game of his career to back Harang’s first win since July 30 as the offense recovered from a weekend vacation in Atlanta, 6-2, in Miami last night. Harang was also backed by four infield double plays. In case you are wondering, the club record is six done three times, the last being against the Mets in 1962. Chase Utley started at third base for the Dodgers on Monday. Blue Jays are 12-5 vs. the Yankees this season, best in franchise history. David Price is 8-1, 1.95 ERA since being traded to Toronto. A free agent this winter, Price has certainly driven up his price. Arizona’s Paul Goldschmidt hit his seventh homer against the Dodgers last night, the most by any player vs. LA since 2004. St. Louis’ 3-1 win was their 31s when scoring three or fewer runs. The Cardinals lead the majors with a 2.89 ERA. Pittsburgh is second, 3.20. 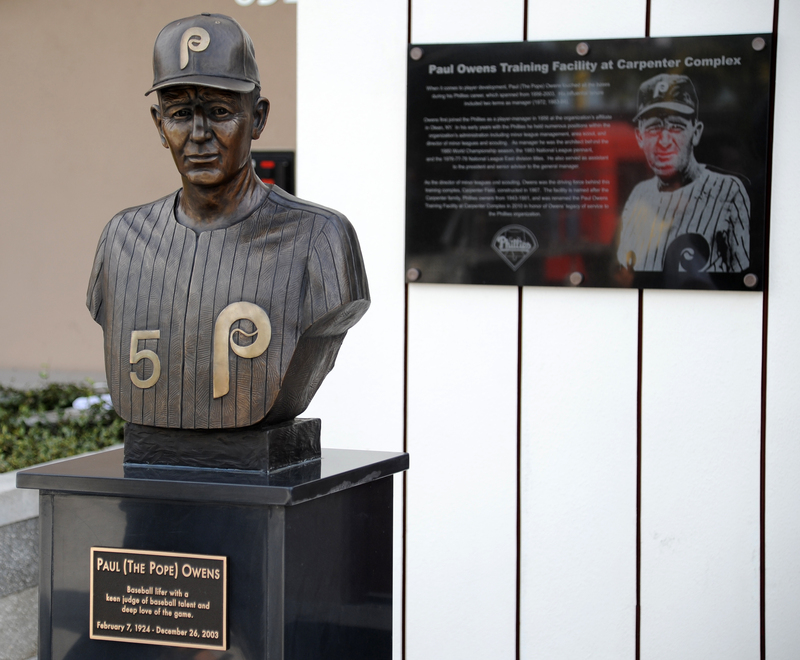 The annual Paul Owens Award, given to the best player and pitcher in the Phillies minor league system, will be presented pre-game on October 1. The Award is named in honor of Owens who spent 48 years in the organization as a player, manager, scout, farm director, general manager, major league manager and senior advisor. 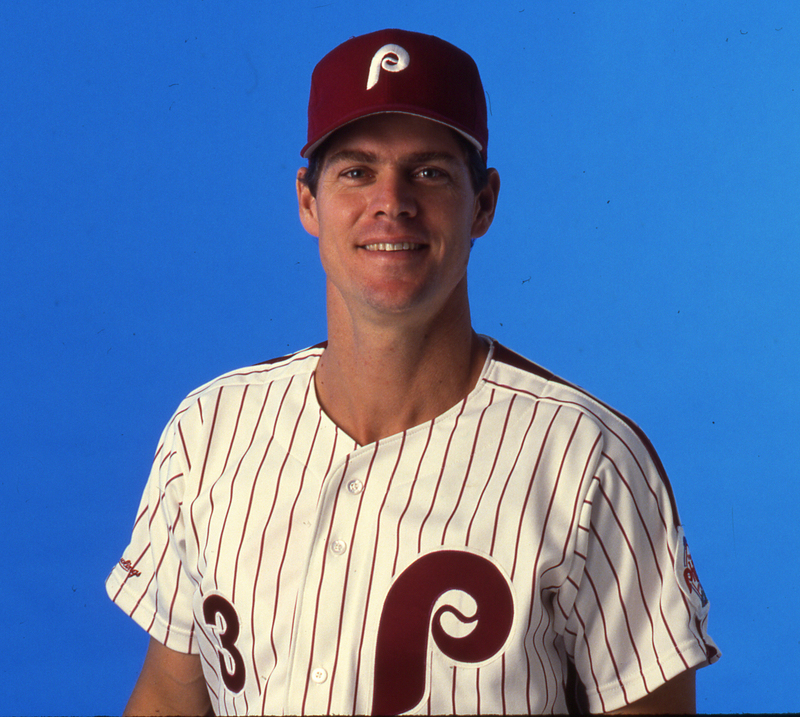 Owens had the vision of a training complex for the Phillies minor leaguers. In 1967, Carpenter Field was opened in Clearwater. The clubhouse is named in honor of Owens. A bronze bust of the Pope is located at the clubhouse entrance. The first winners of his award in 1986 were OF Ron Jones and RHP Marvin Freeman. Current players who were so honored include Freddy Galvis, Darin Ruf, Maikel Franco and Luis Garcia. Astudillo, Willans . . . C, 1B, DH . . . 23 . . . B-R . . . Spent entire season at Clearwater, led league with .314 average; 18 doubles, 3 home runs, 49 RBI, 10 walks, 10 strikeouts in 107 games . . . Signed as an international free agent December 2008 . . . .318 career hitter. Hoskins, Rhys . . . 1B . . . 22 . . . B-R . . . Began season at Lakewood, played 68 games before moving up to Clearwater, 67 games . . . Combined hit .319, 36 doubles, 6 triples, 17 home runs, 90 RBI . . . Fifth round selection in 2014. Knapp, Andrew . . . C . . . 23 . . . Switch-hitter . . . Began season at Clearwater, played 63 games before moving up to Reading where he hit .360 in 55 games . . . Combined hit .308 in 118 games, 35 doubles, 5 triples, 13 home runs, 84 RBI . . . Second round selection in 2013. Stassi, Brock . . . 1B . . . 26 . . . B-L . . . Played entire season at Reading, hit .300, 32 doubles, 1 triple, 15 home runs, league-leading 90 RBI . . . 33rd round selection in 2011. Dygestile-Therrien, Jesen . . . RHR . . . 22 . . . Began season at Lakewood (9 games) and finished at Clearwater (30) . . . Used mostly as a set-up man . . . Combined: 5-0, 1.43 ERA, 5 saves, 63 innings, 50 hits, 17 walks, 54 strikeouts; .218 opponents’ average . . . Selected in the 17th round in 2011. Gueller, Mitch . . . RHS . . . 21 . . . Led NYP League in wins, 10-1; 2.23 ERA, 12 GS, 68.2 innings, 57 hits, 23 walks, 44 strikeouts; .229 opponents’ average . . . Compensation round selection in 2012. Pinto, Ricardo . . . RHS . . . 21 . . . Began season at Lakewood (11 starts) and finished in Clearwater (13 starts) . . . Combined, led organization in wins, 15-4; 2.77 ERA, 145.1 innings, 129 hits, 37 walks, 105 strikeouts; .244 opponents’ average . . . Signed as an international free agent out of Venezuela, 12/28/11. Ramos, Edubray . . . RHR . . . 22 . . . Began season at Clearwater (29 games) and finished at Reading (18 games) . . . Combined, 4-6, 2.07 ERA, 47 G, 69.2 IP, 48 H, 16 BB, 65 S0; .196 opponents’ average . . . Signed as an international free agent out of Venezuela, 3/25/10. Rivero, Alexis . . . RHR . . . 20 . . . Began season at Lakewood (25 games) and finished at Clearwater (16 games) . . . Combined, 4-2, 2.64 ERA, 41 games, 11 saves, 71.2 innings, 48 hits, 18 walks, 67 strikeouts; .188 opponents’ average . . . Signed as an international free agent out of Venezuela, 11/7/12. 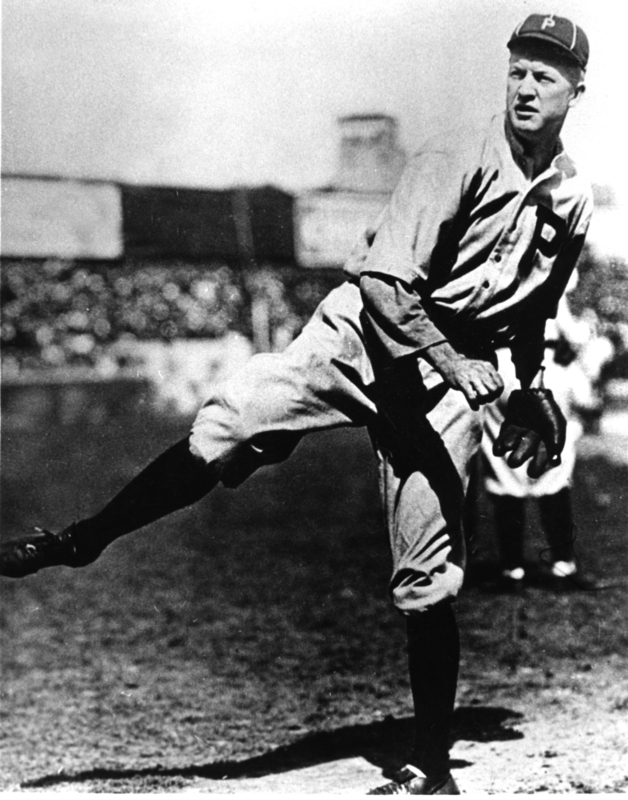 RHP Grover Cleveland Alexander pitches 7-3 and 4-0 complete-game wins over Cincinnati in a double-header at Baker Bowl and ties a major league record by walking only one batter. Almost a year later (September 3) he does it again, 5-0 and 9-3, at Brooklyn, allowing one walk. Al Monchak, the oldest living Phillies Alumnus, died on September 12, 2015. Mr. Monchak was 98 and third oldest major league player. 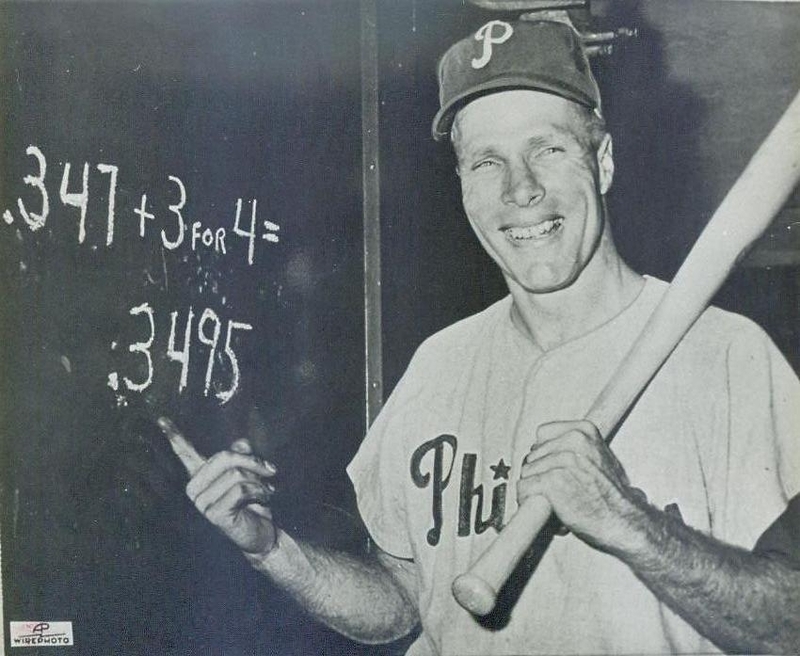 He began his major league career as a shortstop with the Phillies (1940) playing 19 games. Like many players during that time, his career was interrupted when he was drafted. As a member of the Army’s 11th Armored Division, Mr. Monchack fought in the Battle of the Bulge during World War II. His baseball career resumed in 1949, a career in which he was a minor league player-manager, scout, major league coach (1971-1985) for four different teams under Chuck Tanner, and a scout again. 94-year-old outfielder, Wally Westlake, succeeds Mr. Monchak as the oldest Phillies Alumnus. An outfielder, Westlake ended a 10-year career in the majors with five games with the Phillies in 1956. The Braves Shelby Miller last won a game on May 17, 23 straight starts. Since then, 17 different Braves pitchers won a game. The Mets magic number is 7. The Reds’ Joey Votto walked for the 136th time last night, breaking his own club record set in 2013. Phillies club mark is 129, Lenny Dykstra, 1993. Missing Franco, Hernandez and Howard from the starting lineup has certainly had an effect on the Phillies offensive production. Six straight losses including a series sweep of three weekend games in Atlanta in which they dropped three straight 2-1 decisions. Phillies got three straight strong performances from their starting pitchers but three bullpen losses. Morgan, Eickhoff and Nola were the starters, allowing a total of three runs. Because of his shoulder surgery of Jan. 8, 2014, Morgan didn’t pitch at all last season. This season he has 152 between AAA and the majors. He’s being shut down for the rest of the season. Offensively, the Phillies produced three total runs on 16 total hits that included one double and one home run. Loss #100 is just six away with 12 to play. Well, things could be worse! E-A-G-L-E-S.
How important is pitching? The top five teams in the majors in ERA are all headed for postseason play: St. Louis, Pittsburgh, LA Dodgers, NY Mets, Chicago Cubs. The bottom five: Boston, Atlanta, Detroit, Phillies, Rockies. Detroit, Phillies, Miami, Toronto, Oakland. Top five in batting average: Detroit, Kansas City, San Francisco, Boston, Toronto. Bottom five: Houston, Mets, Cubs, San Diego, LA Angels. St. Louis, San Francisco, Phillies, Miami, Atlanta. Top five in fielding percentage: Baltimore, Dodgers, Miami, Houston, Arizona. Bottom five: Phillies, Pittsburgh, Texas, Milwaukee, Oakland. 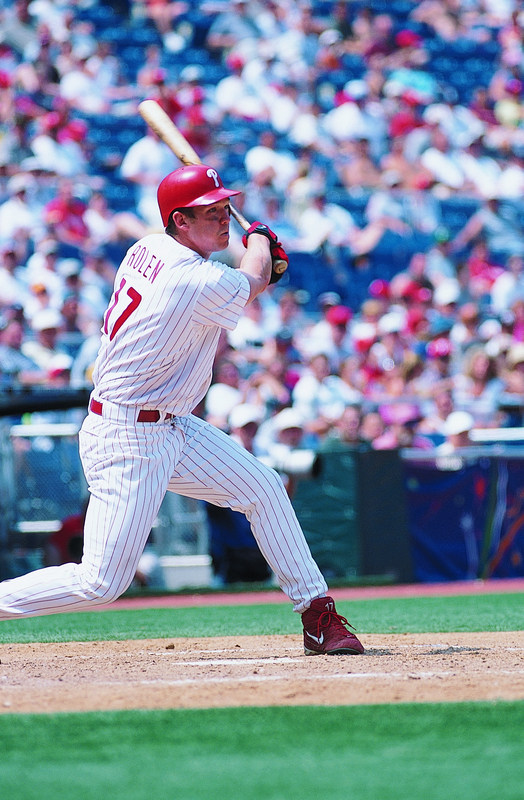 Check http://www.phillies.com/alumni for the latest notes about Phillies Alumni. LHP Steve Carlton passes RHP Bob Gibson as the NL’s all-time strikeout leader when he fans Montreal CF Andre Dawson in the third inning for his 3,118th strikeout. Expos win, 1-0, in 17 innings at Montreal. Kendrys Morales of the Royals had a single, triple, three home runs and five runs scored in four at-bats but only drove in three runs. Felix Hernandez of the Mariners finished the season 5-0, 1.83 ERA vs. the Rangers. Jimmy Rollins pinch-hit on Saturday, his first at-bat since September 6. He was sidelined with an injured right index finger knuckle. In walk-off decisions, the Rays are 2-11 after winning on Sunday. Yadier Molina left the game on Sunday with a thumb injury. When he is playing, the Cardinals are 88-58. When he’s out of the lineup, 5-8. Cole Hamels is 4-1, 3.73 ERA for nine starts with the Rangers who have taken over first place in the AL West. Jake Diekman, 0-0, 2.37 for 21 appearances. The Reading Fightin’ Phils magical season came to an end as the Bowie Baysox won the Eastern League championship with a 7-2 decision at home on Saturday night. Trailing, 2-1, in the best-of-five, Bowie won two in a row. Last time Reading was the outright champion of the league was 1995. In 2001, they reached the championship round which was canceled following the 911 terrorist attacks. Reading was ruled as co-champions with New Hampshire. LF Cam Perkins homered in the fourth inning to give Reading a 1-0 lead that as erased by two Baysox runs in their at-bat. Loser was Reinier Roibal who allowed two runs in 4.1 innings. Three of the next four Reading relievers gave up runs. SS J. P. Crawford led Reading with a .379 postseason average, hitting in all seven games. CF Nick Williams topped the team with three postseason homers. Reading’s season began with a 4-2 loss in the first game of an April 11 double-header in Portland following two cancellations because of snow. Reading’s pitchers that day were Aaron Nola, the loser, and Elvis Araujo. Both eventually made it to the majors. Dusty Wathan, the Eastern League manager-of-the year, had a revolving roster during the season, something this is pretty typical in the minor leagues. He shook hands coming and going: in addition to Araujo and Nola, OF Aaron Altherr and LHP Adam Loewen began with him and eventually wound up in the majors . . . LHP Jesse Biddle, OF Kelly Dugan, C Gabriel Lino and OF Brian Pointer advanced to AAA . . . LHP Joely Rodriquez, the lone player on the Phillies 40-man roster, took the opposite route . . . KC Serna went AA-AAA-AA; he began as the shortstop and ended at second base . . . Carlos Alonzo, the incumbent second baseman, played 12 games and missed the rest of the season because of a knee injury . . . CF Roman Quinn, the switch-hitting speedster, was injured on June 12 and never returned. He was replaced by Destin Hood, a minor league acquisition . . . RHP Zach Eflin spent two weeks with Team USA in the Pan Am Games . . . SS J. P. Crawford, C Andrew Knapp, 2B Brodie Greene, Roibal, RHP Edubray Ramos, INF Angelo Mora and OF Dylan Cozens began the season in Clearwater . . . Starting pitcher Tom Windle moved to the bullpen on June 30 . . . RHP Ethan Martin came out of the organization’s rehab program, pitched once at Clearwater before moving up to Reading on July 20 . . . RHP Jake Thompson, RHP Nick Pivetta, RHP Jimmy Cordero and CF Nick Williams came over to the Phillies organization in July trades . . . 1B Brock Stassi and LF Perkins were the only players who were at the same positions on opening day and the last game. Phillies fans became familiar with the names at Reading. Several of the Fightin’ Phils are considered building blocks for the major league club. MLB.com Pipeline rated the Phillies minor league system the seventh best. A year ago they were in the bottom 10. There’s hope for the future. Bowie forced Game 5 of the best-of-five Eastern League championship by trouncing Reading, 9-1, on Friday night at Prince George’s Stadium. The Baysox scored three in the first inning and iced the game with three more in the seventh and a pair in the next inning. David Hess and two relievers held the Fightin’ Phils to four singles and one walk while striking out 12. RF Dylan Cozens had half of Reading’s hits. Reading was 0-8 with runners in scoring position. The Fightin’ Phils run came on a wild pitch in the fourth inning. Ben Lively was charged with seven runs on seven hits in six innings in taking the loss. The championship game will begin at 6:05 p.m. on Saturday in Prince George’s Stadium.